We have taken one other hot air balloon ride in our lives and that was a low altitude ride over the Masai Mara plains of Africa. It was incredible and I wasn't nervous at all. 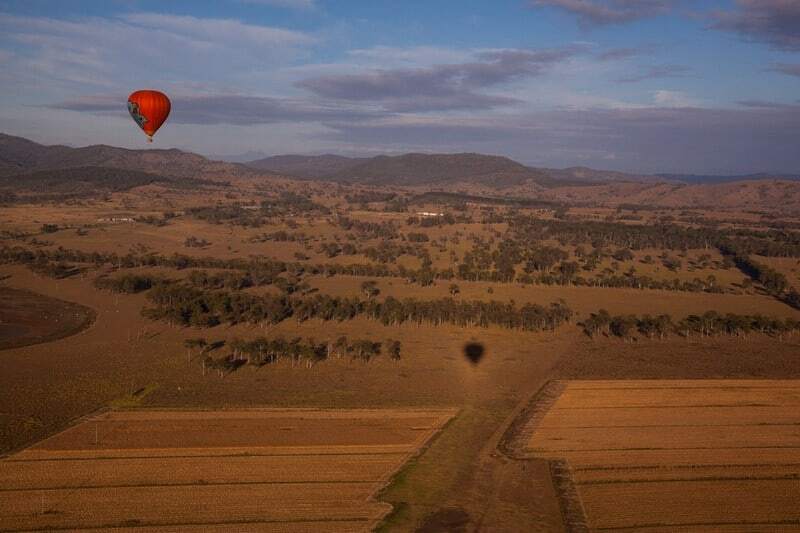 But in Australia's gold Coas we were hot air ballooning at another level. We're going how high today? I said to Dave after the pilot of our hot air balloon told us we'd be reaching an altitude of 3000 feet. That's 1 km in the air! we'd be going way up, I started to feel my knees go weak. It was 4:30 am when our van picked us up at Peppers Broadbeach Resort on Australia's Gold Coast. The rain was pouring down and we were sure our flight would be cancelled. We have attempted two other hot air balloon rides in the past that were cancelled due to inclement weather and we anticipated the same thing happening here. 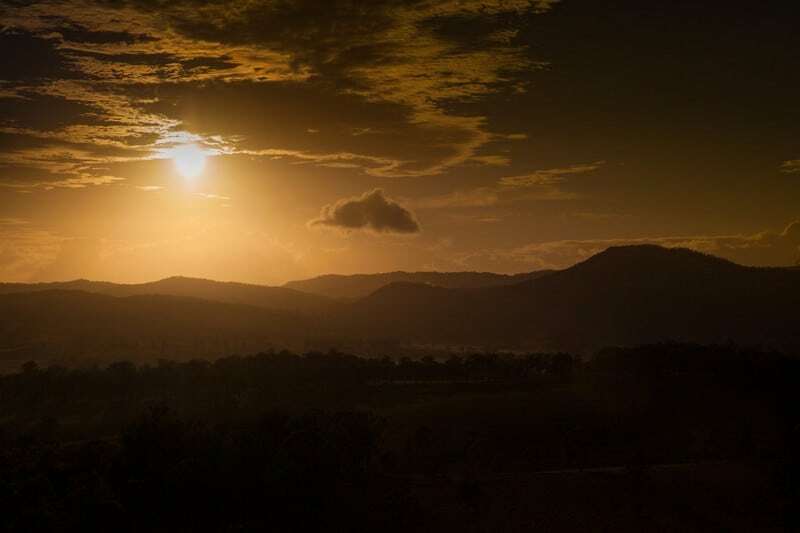 However, as we made our way farther inland to Canungra, the weather cleared and we were treated to a beautiful sunrise and things were looking good! We saw a smaller red balloon and a giant yellow balloon being inflated. For some reason, Dave wasn't thrilled about the huge yellow balloon. He said to me, “We're going to be put in that one, I just know it.” Sure enough, when they split up the group, we were on the yellow one. When traveling with Dave I tend to get a bit frustrated. 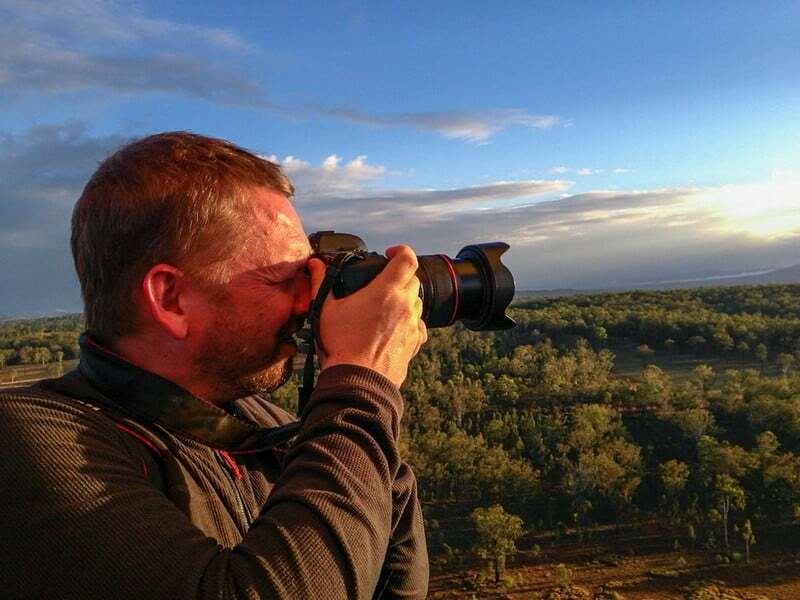 He is an amazing photographer, but often times the tour becomes about the photos rather than the experience. He was armed with his two cameras ready to take pictures but because we were going on the larger balloon that holds more people, he was afraid that he was going to have heads in every shot. I guess the guides took pity on his pouty face because even though we were standing at the front of the line, they left us for last when loading up and we lucked out with the corner of the basket giving Dave and unobstructed view of the horizon. Dave enjoys some great light! As it turned out, the yellow balloon was amazing! 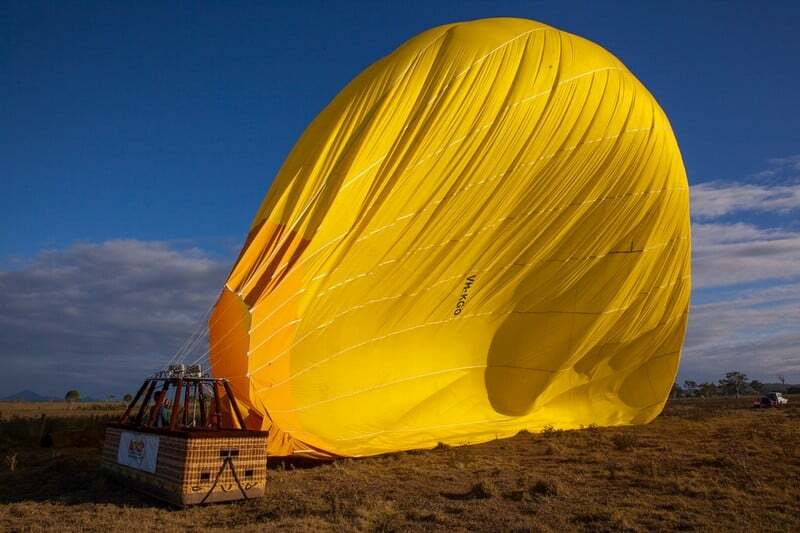 It's the largest balloon in all of Australia and there are only two that are larger in the world. That would be in Egypt and Turkey. Our pilot had been flying all his life and he had the confidence to go higher and higher. When we reached 3000 feet, he said: “We're going to go to at least 4000 feet today”. As the landscape below dropped far away, I felt a pang of anxiety. I know that a fall whether its from 4000 feet or 400 feet is going to do the same damage, but being up there with nothing but air around me, stressed me out. Dave took photos like it was nothing while I clenched my grip to the basket pasting a smile on my face so nobody could see my anxiety. We drifted way up for a few minutes and then we lowered our elevation to see the kangaroos below. It's amazing how much better I felt just being a couple thousand feet lower. Having a clear view of the ground made me comfortable and I could finally raise my camera again and take some video and photos. We were still quite high though. We drifted over the other balloon and kept on flying as he landed his in a far off field. Our flight was a half an hour, but time flies when you're flying high! It felt as if we were in the air about 10 or 15 minutes. Even though it went fast, we felt satisfied. You don't need hours up in the sky in a hot air balloon. 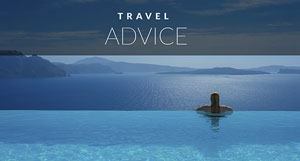 A half hour is more than enough time to enjoy the experience and to give you time to relax. By the time we landed, I was ready for breakfast. 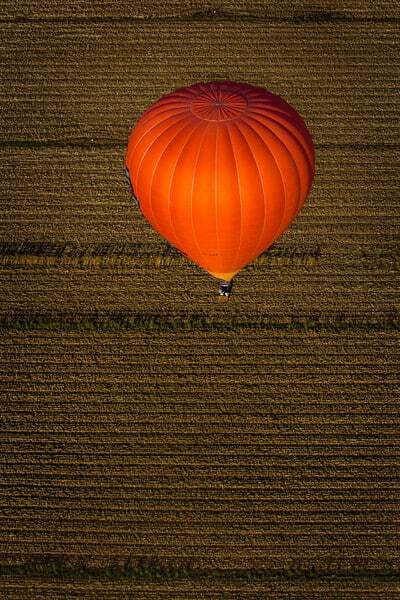 We enjoy the peacefulness of a hot air balloon Ride. As the ground approached, our pilot told us to hold on, there could be a bump. I have heard of people having huge bumpy landings during their flights, but both of our times in a hot air balloon have been smooth. There is a little jolt once you hit the ground, but if the conditions are good and your pilot is experienced, I believe the landing isn't as painful as many believe. We braced ourselves for a tiny little hop and in a couple of seconds, we came to a stop. Once we were out of the basket, we helped the crew and pilot pack up the balloon. It's a lot of work pushing the air out and folding the nylon in, but within about 10 minutes, we were packed up and taken for breakfast at a winery where we enjoyed a glass of champagne and a huge buffet. The sun was shining, the air was warm and our bellies were full. It was a good day and it was barely 9:00 am. Ah, Queensland, how we love you and want to come back soon. If you get the chance to ride on a hot air balloon, anywhere, do it. It's a thrilling experience that you will never forget. 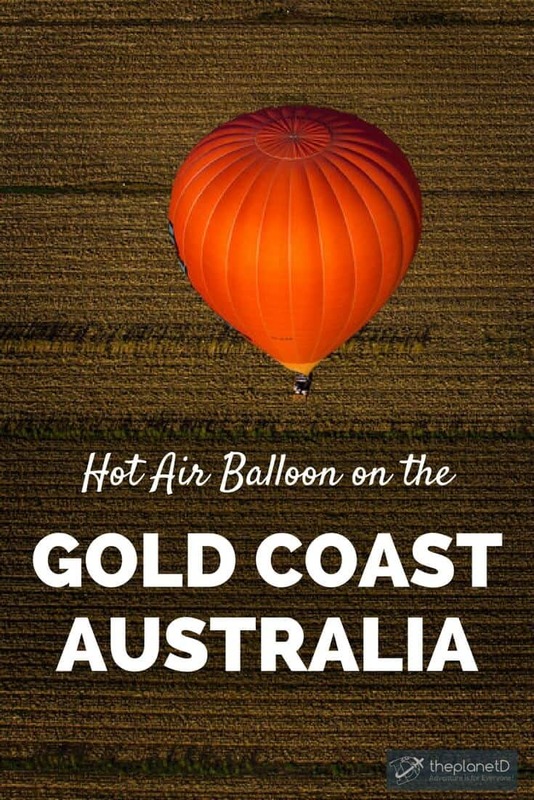 For information on hot air ballooning on the Gold Coast visit Hot Air. 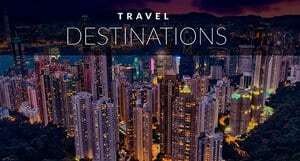 They have locations in Cairns, Brisbane and Port Douglas as well. 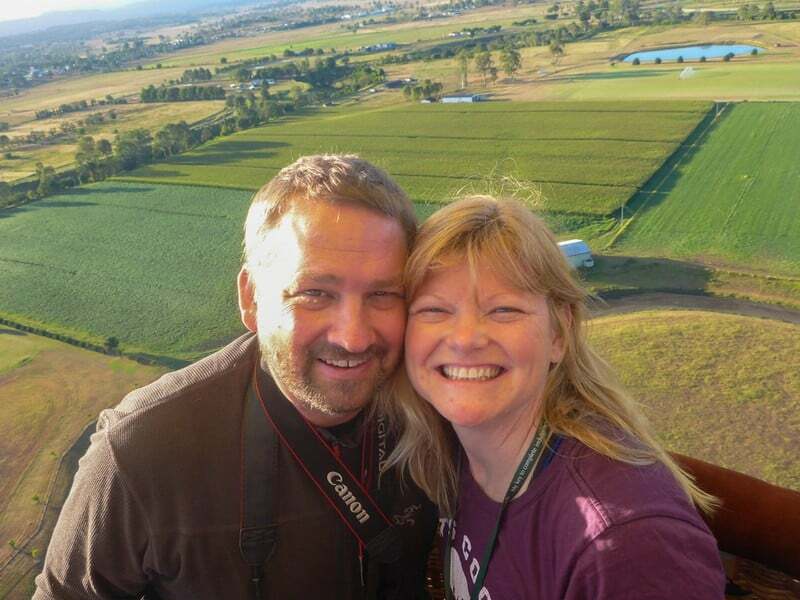 34 Responses to "Flying High, A Hot Air Balloon Adventure on the Gold Coast"
Fantastic experienced. It was so enjoying to read your post. Thanks for this information and inspiration. Your pictures are just beautiful! That’s amazing you had the opportunity to be in such a large balloon up so high. Thanks for sharing this! I agree. It is a thrilling experience to go ballooning! As you know, we were married in a hot air balloon so I always get that little catch in my throat and tear up at the memory. We definitely need to hot air balloon more often! I’d imagine I’d feel the same as you did Deb. Even though I’ve jumped out of a damn airplane when I was 19 I still get anxiety & sometimes vertigo with heights. Nevertheless I’d still love to ride in a hot air balloon, looks like a great way to challenge myself. We love hot air ballooning. Come to Albuquerque at the beginning of October for the largest gathering of balloons in the world! That would be amazing to see! Have you participated in that event? This looks amazing! What spectacular views. It’s definitely added to my bucket list :). 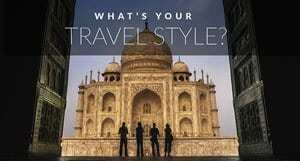 It’s a great adventure that I think everyone should try once in their travels. Such an extraordinary way to see the landscape. I’d love to ride a hot air balloon some day, but it scares the beheebeedjeebees out of me. I have a terrible fear of heights. When we flew over the Masai Mara in Kenya, I had no fear whatsoever. It feels like you are simply floating in the air. It’s amazing because you don’t even realize you’ve left the ground. The same feeling happened here in Australia. I only had a pang of anxiety when we went really high. For some reason, I was fine at 2 thousand feet or so, but when we went higher, I stressed out a bit. Luckily we werne’ tup for so long. I think you’d love it. I have quite the fear myself. Awesome pics! I recently went hot air ballooning for the first time in Cappadocia and loved it! I will be going when I visit the Gold Coast now for sure. This is awesome guys! Would love to give this a go someday and GC looks like a good spot to do it. What an excellent experience. I have always desired to go on a hot air increase drive, and it looks like Australia is an ideal position to do it! It is a really awesome experience. thanks for sharing your experience. Beautiful experience! 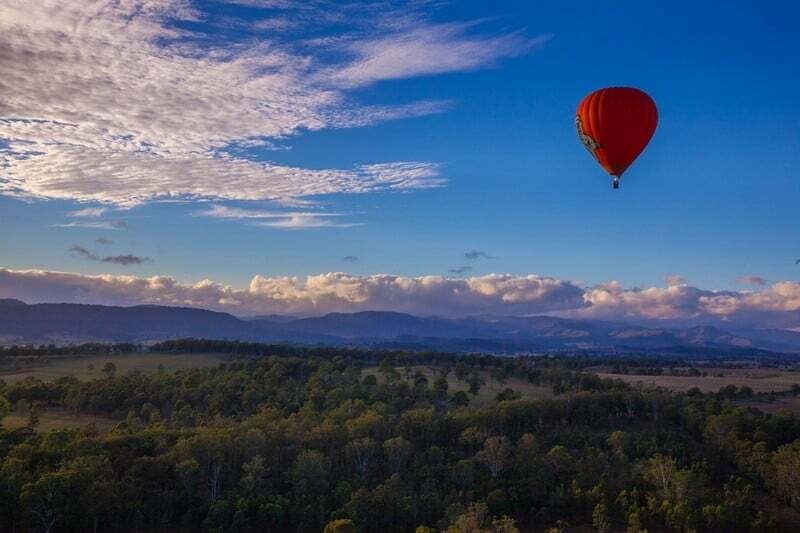 The Gold Coast looks like a truly amazing place to go for a hot air balloon ride. 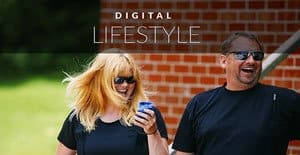 We went on one during our honeymoon in New Mexico, and it was definitely one of the most memorable things we did! I believe it was a thrilling experience. I am afraid of heights and i don’t know if i will ever take a hot air balloon. Hope in future i will overcome my fears. Wow! Awesome adventure. Your pictures look really amazing. Awesome! I’d love to go on a hot air balloon ride! Although I think I’d be pretty nervous. I can totally sympathize with your husband on focusing on getting good shots. But it paid off, the photos look gorgeous! 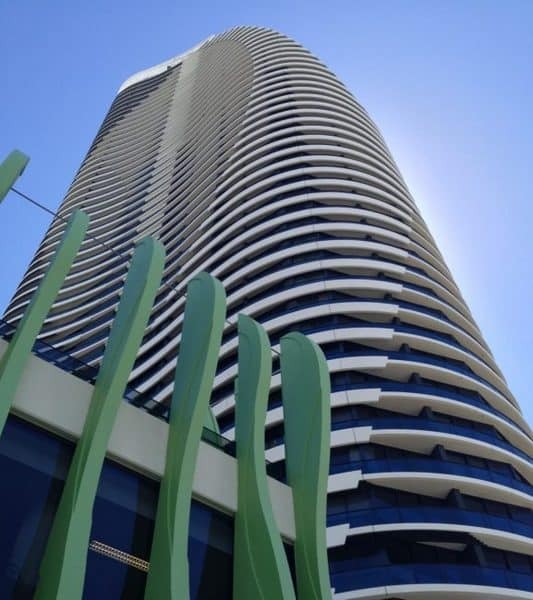 Definitely have to check this out when we get to the Gold Coast. Seriously amazing! I’m sure it’s an unusual experience. It is a really cool experience. I remember seeing a hot air balloon flying over Udaipur when we were there. I think that would be a beautiful place to be in a balloon. Call me crazy but I have jumped out of a plane, bungee jumped, gone white water rafting, etc. but I would be TERRIFIED to ride in a hot air balloon. Without the quick pace and adrenaline running, I can’t do it. Haha, I know what you mean. It was the fact that all that was between me and the ground was a basket that was about as high as my ribs. I felt like if I leaned over too far I’d fall out. But once we came down from 4000 feet and floated about about 1000-1500 I felt much better. Most people seemed completely relaxed so it was definitely just me. What a great adventure. 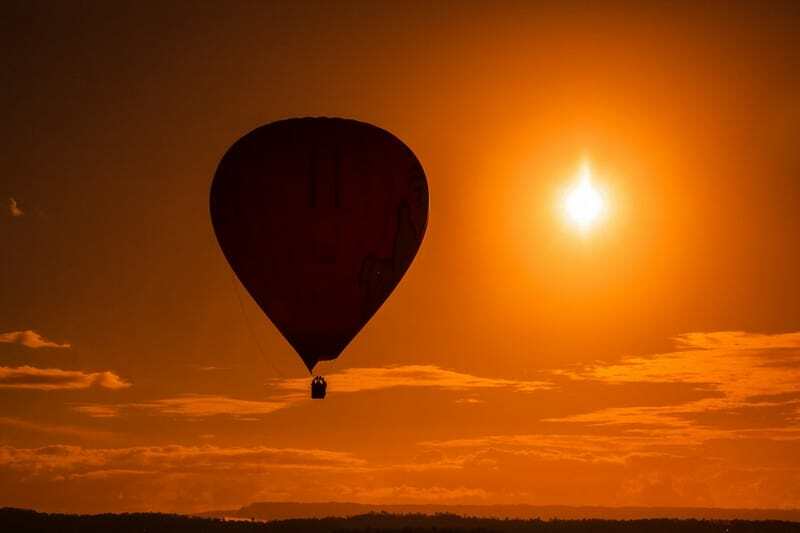 I have always wanted to go on a hot air balloon ride, and it looks like Australia is a perfect place to do it! A hot air balloon ride is the coolest thing to do. We always wanted to do one ourselves and had our first ride just last year. It’s such a magical thing to float through the air. Australia is a gorgeous place to do it. And it’s really cool to be on such a huge balloon! WOW! What an experience… .. and what a beautiful countryside pictures. Very high on my wish list now… got to do it. asap….